These are profiles of some of the members of the Dirt Girls. Joined Dirt Girls in 2002. Favorite Ride: I have two. Sidewinder in early summer when it seems every flower is blooming and, Crazy Canyon to the top of Sentinel then all the way down Hidden Treasure (ending at Dairy Queen). Best Dirt Girl Memory: The entire 2004 season. I had knee surgery in Feb. that year to repair my torn ACL. The genuine support and light hearted attitude kept me going back each week even when it hurt. This year I feel as good even better?) than new! 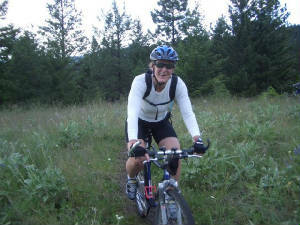 Regular Life: Along with Dirt Girl excursions, I enjoy mountain biking, hiking, skiing, and snowshoeing with my husband Randy and our two dogs. When I'm not playing outside, I work as a book designer (and am lucky to love what I do for a living). 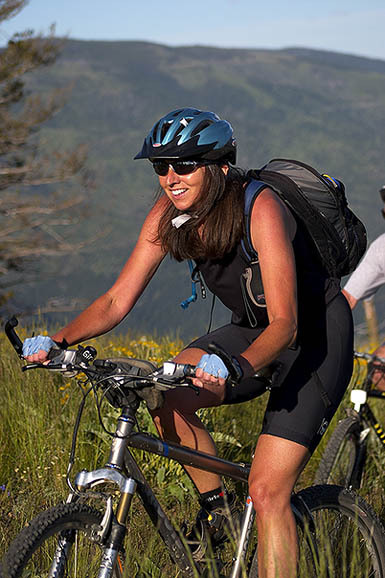 Why I'm a Dirt Girl: Dirt Girls = Good exercise, good scenery, and best of all good company. The group is ever changing as new women join and old members move on. The Dirt Girl ride is ALWAYS one of the highlights of my week. Joined Dirt Girls in 2001. Founding member. Favorite ride: The ones that are half up and half down, particularly in that order. Regular life: I like a variety of sports: mountain biking, windsurfing, tennis, hockey, downhill skiing. I work as a project manager for information systems to pay for them all. Why I'm a Dirt Girl: Great way to meet new people, share some tips on riding, and get a good workout while enjoying Mother Nature's finest. Favorite Ride:I'm torn - my favorite ride is either Woods Gulch or Sawmill Gulch coming down through the Curry Cabin way (have I got that right??). Ah heck, they are all great. Regular Life:Life other than than the Dirt Girls includes running, backpacking, hiking, cross-country skiing, road biking, quilting, my day job as an attorney, and my family and friends. Why I'm a Dirt Girl: What I like best about Dirt Girls is all of the great riding and the fun, intelligent and classy women you get to hang out with (and of course, the occasional treats at DQ, Arriba, etc). 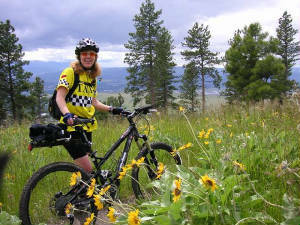 What I do when I'm not recreating: I work at Adventure Cycling Association as the Membership & Development Director. Post items to this web site. 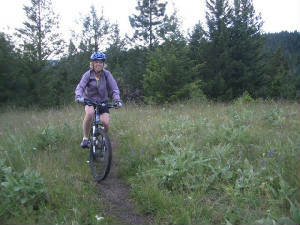 Why am I a Dirt Girls: It gives me a good reason to get out each Tuesday night and the other women are so much fun! If you are willing to be profiled, send us an email.